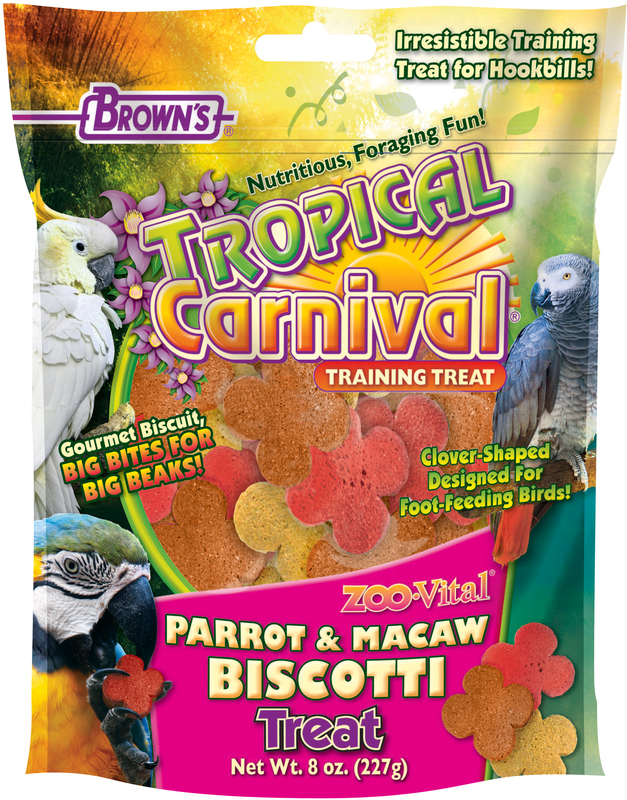 In the classic manner of Old World Style Biscotti, we fashioned our Zoo-Vital® Parrot & Macaw Biscotti Treats. They’re the perfect taste-tempting, healthy compliment to your bird’s meal. They’re also a great training reward treat. 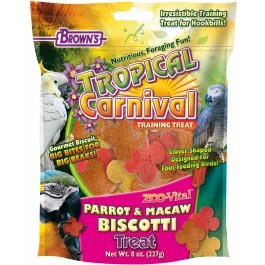 In the classic manner of Old World Style Biscotti, we fashioned our Zoo-Vital® Parrot & Macaw Biscotti Treats. They’re the perfect taste-tempting, healthy compliment to your bird’s meal. They’re also a great training reward treat. These twice-baked biscuits are a masterpiece of symmetry in shape, ideal for foot-feeding parrots and macaws. 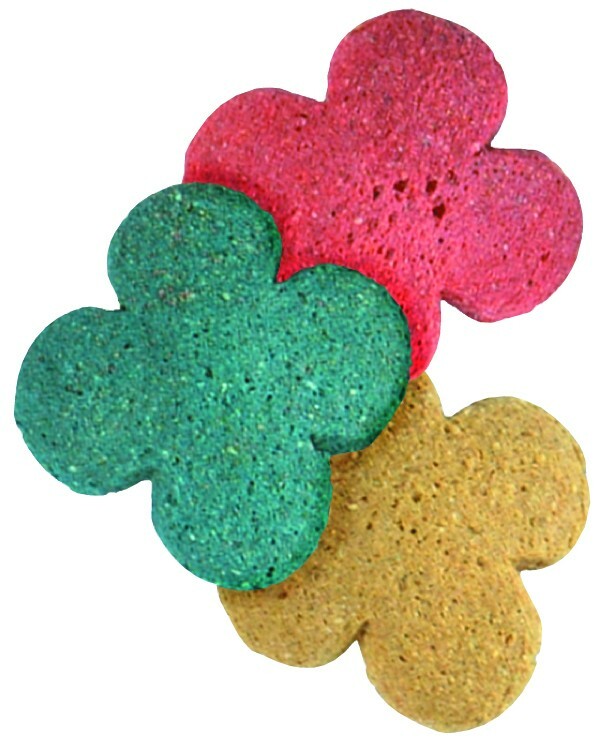 We’re sure your companion pet will agree you have given them something very nutritious and fun to eat. • Fortified with vitamins and nutrients for the overall well-being of your bird. • Irresistible Training Treat for Hookbills! • Beneficial bacteria added to support healthy digestion. • Appealing textures preferred by birds with big beaks. Ground Oats, Ground Corn, Dehulled Soybean Meal, Corn Gluten Meal, Fructose, Sucrose, Soybean Oil, Dicalcium Phosphate, Brewer’s Dried Yeast, Calcium Carbonate, Algae Meal, Fructooligosaccharide, L-Lysine, Salt, Vitamin A Supplement, Vitamin D3 Supplement, Vitamin E Supplement, L-Ascorbyl-2-Polyphosphate, Thiamine Mononitrate, Menadione Sodium Bisulfite Complex, Vitamin B12 Supplement, Choline Chloride, Manganese Proteinate, Iron Proteinate, DL-Methionine, Zinc Proteinate, Sodium Selenite, Dried Bacillus subtilis Fermentation Product, Dried Aspergillus oryzae Fermentation Product, Dried Lactobacillus acidophilus Fermentation Product, Dried Lactobacillus casei Fermentation Product, Dried Bifidobacterium thermophilum Fermentation Product, Dried Enterococcus faecium Fermentation Product, Dried Aspergillus niger Fermentation Product, Biotin, Folic Acid, Lecithin, Mixed Tocopherols (a preservative), Yucca schidigera Extract, Rosemary, Carotene, Titanium Dioxide, Orange Oil, Red 40, and Yellow 5 & 6. Total Lactic Acid Bacteria (min) 75,000 CFU/g (Bacillus subtilis, Aspergillus oryzae, L. Acidophilus, L. casei, Bifidobacterium thermophilum, Enterococcus faecium & Aspergillus nijer “in descending amounts”) Contains a source of viable naturally occurring microorganisms.